The new facility will allow South Africa to compete internationally in the production of nano-structured materials, according to the DST. The Department of Science and Technology (DST) has partnered with the Council for Scientific and Industrial Research (CSIR) to unveil a production facility for nanotechnology materials in South Africa. Located in Pretoria, the new facility will help the plastics and cosmetics industries, among others, to develop new nano-structured materials. The facility houses infrastructure for scale-up, processing and testing. It will also play a role in developing skills and transferring technologies to industry, says the department. Dubbed the Nanomaterials Industrial Development Facility, the new production facility is one of the five programmes funded by DST, through the CSIR, as part of the Industrial Innovation Partnership Fund (IIPF), which seeks to support industry competitiveness. 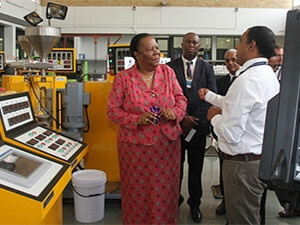 Science and technology minister Naledi Pandor says the facility provides the capabilities for the industrial-scale production of nano-structured materials. "All the facilities supported under the Industry Innovation Programme, including the Nano-materials Industrial Development Facility, have the potential to play a role in the development of high-technology small, medium and micro enterprises. This facility could enable such enterprises to take advantage of the rapidly growing international market in nano-structured materials and nano-composites," says Pandor. Last year, Pandor said government wanted more South African-developed nanotechnology-enhanced products to enter the market in the coming years. Previously, Pandor explained that the National Nanotechnology Strategy, which was published in 2005, focuses on adopting formal teaching programmes in the field, with more than 1 100 papers being published by tertiary institutions. According to the DST, one of the industries set to benefit from the research advances and introduction of an industry-scale testing facility is the plastics industry, both in the level of advanced materials used, and in the machines and processes used to produce plastic components and systems. Director at the National Centre for Nanostructured Materials and CSIR chief researcher, Professor Suprakas Ray says, "Due to the high cost of importing nano-structured materials and the absence of local manufacturing capability for these materials, the plastics industry is generally struggling to adopt advanced polymers on a large scale. If these challenges are not addressed, there will be continued importation of special polymer material and products at significant cost and to the detriment of local manufacturers."